I may have touched on this in a past post, but thought I’d reshare just in case you missed it or never read it. I get a lot of questions and comments about stepping away from my casual everyday style. Readers always want to see my ‘night’ outfits or more business wear. While, I’ll be sharing more of these styles going forward, the honest truth is I don’t differentiate or separate the styles. I used to feel like I needed to dress up if I was going out to dinner or grabbing drinks, but I never really felt comfortable in whatever I was wearing. I was forcing a style that wasn’t me. So, a couple years ago I decided to ignore the rules and go with my gut. I pretty much wear the same looks for day, night, work, and occasions (with exceptions to weddings, cocktail or themed parties). Most of the time I can get away with wearing the neutral, casual pieces you see on the blog, although there are times where I’ll be wearing the same outfit, but swap out accessories and shoes and change up my jacket depending on where we’re going. For me, it’s about wearing what makes me feel comfortable, confident, and chic, so if that means wearing distressed boyfriend jeans with heels or heeled booties on a night out with the girls, I’m all for it. I also really love the unexpected element of casual pieces worn in a more dressier setting (think jeans and tee with heels). The moral of the story, I wear the same casual outfits you see me wear on the blog for almost all occasions, I just switch out my accessories and shoes. Perhaps, I can show you how I do this more often? This outfit is a prime example. I wore this look to dinner while in Black Butte, but could easily wear it during the day, to a BBQ, birthday party, anything really. Most of you would say it’s very casual, but I love that the silk cami and mirrored sunglasses elevate the look and make it more appropriate for night. The most important part is how the look makes me feel. Since all the pieces pulled together make me feel chic, I could rock this outfit anywhere. You could even add a denim jacket, leather jacket, crewneck sweater to make it even more versatile. I am LOVING this look! That belt bag is perfection! First, I adore this look. 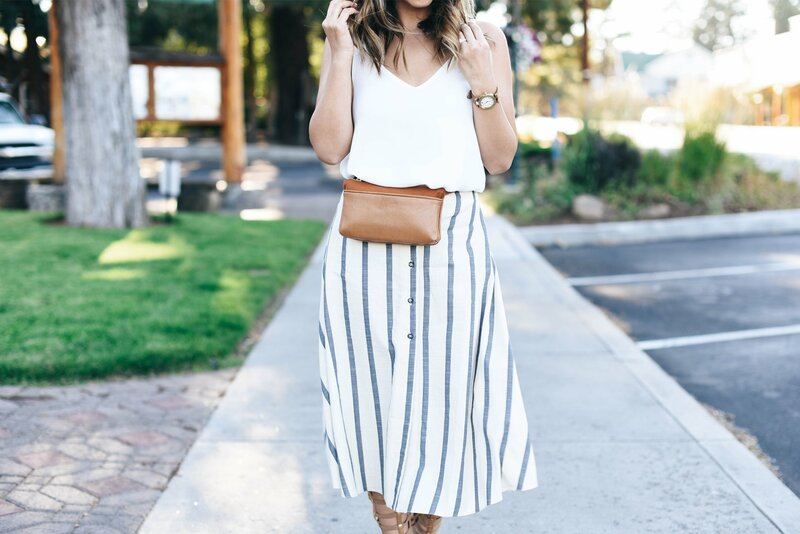 Such a great skirt that can be worn in so many different settings. I couldn’t agree more with your philosophy about wearing what makes you feel comfortable. I happen to share your love for denim…especially ripped up, worn in denim. I have dressed up holey jeans many times and briefly wondered if people find it to casual or not appropriate. Of course, I wear them anyway! I also love looks that can easily go from day to night. Perfect for traveling, for those of us that want fewer, better pieces in our closets, etc. This is a fabulous post, and outfit. Love it! Thanks, Gina! I feel you on all of this. Easy transitional pieces are the best! I’ve gone through the same thing. Most of my outfits now are pretty similar and for any occasion. I absolutely hate dressing for “going out.” Its not really a problem because I don’t go out much anymore! But on the rare occasion I do, I’m not really sure what to wear and I always end up stressing. Not worth it. Definitely feel you on that one. It’s the whole idea of getting ‘dressed up.’ I think if you swap an accessory or add a bold lip, you can easily dress up your day outfit. Make it easy and always go with what makes you feel your best! Love this look! Your skirt is gorgeous, and those sandals… perfect! Great outfit. The fanny pack is everything! So glad you posted this! Often I see posts of ‘what to wear for date night’ or something similar and they show like bodycon dresses and sky-high heels which I would never wear just to go to dinner, nor do I ever see actual people dressing like that! lol But I agree with the sentiment – wear what you feel comfortable and confident in! Thank you! It’s currently snowing, so summer sounds good right now… although the snow is really pretty lol.